This time it’s the turn of the puff stitch flower. This stitch is easy to do once you have mastered drawing up the loops to the right height – you’ll only need to try this a few times to get it! 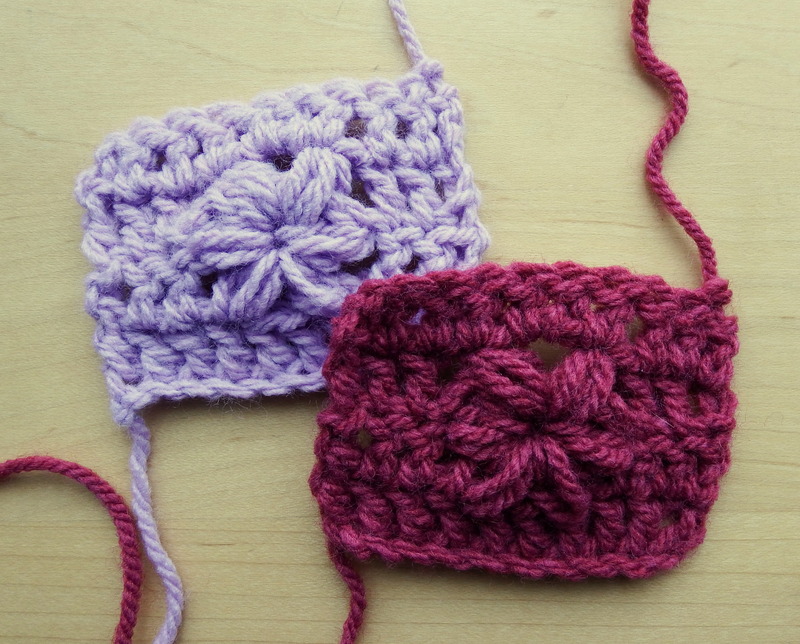 And once you know this stitch you can use it to pretty up any plain double crochet piece you are working on. I’ve used this stitch in my Flower Trails Fingerless Gloves as well as another project I’m working on – Pocket Full of Posies Pouch (more on this soon)! The flowers in the pattern are made using 6 puff stitches. Petals 1-4 are made in row 2 of the pattern, and then petals 5 and 6 are made in the following row. The whole flower uses 4 stitches from the row below. Chain 3, yarn over, insert hook into back ridge of first chain and pull up a loop to the length of the chain, yarn over, insert hook in same place and draw up a loop (5 loops on hook). These loops will form petal 1. Yarn over, insert hook into next st and draw up a loop so that it is level with the row of dc’s you are working on. Yarn over, draw up a loop (4 more loops on hook – 9 total). These loops will form petal 2. Skip 2 sts. Yarn over, insert hook into next st and draw up a loop so that it is level with the row of dc’s you are working on. Yarn over, draw up a loop (4 more loops on hook – 13 total). These loops will form petal 3. Yarn over hook and draw this loop through all 13 loops, ch1 tightly to secure. This makes an “eye” at the flower centre. Chain 3, yarn over, insert hook into the “eye” and pull up a loop to the length of the chain, yarn over, insert hook in same place and draw up a loop (5 loops on hook). These loops will form petal 4. Yarn over hook and draw this loop through all 5 loops, ch1 tightly to secure. You have now made the 4th loop – the next st will be a dc into the next st.
Ch2, and repeat the step above to make the 6th (The next st will be a dc in the next dc st which stabilises the 6th petal). 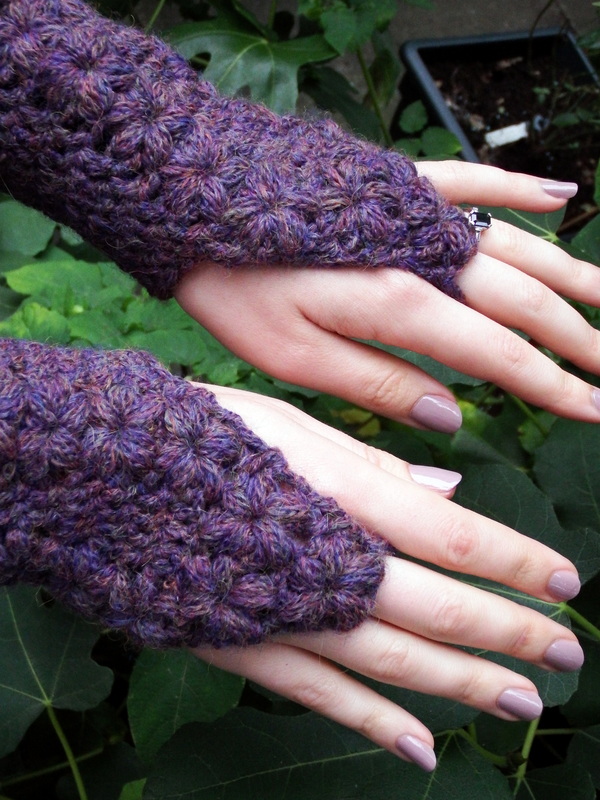 lovely pattern however it looks as though you are stitching into the turning chain before you begin your second row. is that correct or does it just appear that way? i never stitch into the turning chain but perhaps your pattern calls for it? ( difficult to tell the way the video is shot and position of your thumbs) thank you so much if you respond. Hi Sara Ann! Yes, I am stitching into the turning chain. In general a pattern will tell you whether or not the chain counts as a stitch. Usually for single crochet it doesn’t and for double crochet it does. But it really depends on the designer and how they were taught. I say that as long as you end up with the right number of stitches and you’re happy with the result, do it whichever way you prefer! In my patterns I’ll always try and tell you whether it counts as a stitch or not. If you prefer it not to count as a stitch then just work an extra dc (or whatever stitch the turning chain counts as) before you follow the remaining instructions for the row. I would like to make scarf with these flowers in the middle of the scarf. Can you please tell me how many chains I need to crochet this scarf. The flowers could be spaced out instead of one above the other. Thank you for your time and it is aw wonderful video!! !